One of the areas of the field that I like to exploit is the boundary or short side of the field. The last couple of seasons I have seen teams take advantage of this field zone because defenses do not want to over rotate safeties to the short side of the field. This is a field zone that when attacked correctly can lead to some very explosive plays. One of my favorite ways is to flood the boundary with different level of vertical routes. There are many different ways to do this, but I will share a few cut-ups of my favorites over the last year. Introduction: One of the things I love about this blog is that I get to pick a couple of topics and research them. The challenge is always trying to find enough good video share. In this weeks post I am going to share a few thoughts that I have on Gap Schemes. I was very lucky to find some great schemes that I had in my HUDL RPO LIBRARY. The film clips that I am sharing with you are just a few of the 1,500 that are in the RPO Library. If you think this stuff is good you should see what the library has to offer. One of the concepts that I added to my teams playbook for the playoff was the "King" gap scheme. This year I have been searching for variations in formation and RPO concepts that I can add to this very versatile concept. One of the reasons I like this concept is because it forces the defense to add a defender in the box because of the H-back. If the defense does not match up numbers in the box, or overloads to the formation strength it is easy to create an explosive run play for the offense. Below are a few concepts that I thought you might like to see. If you use your H-back to help seal the edge in Sprint out pass protection you will like the Sprint Draw King Concept. This is a great way to break a tendency that you may find at the mid-point of the year. Diagram-1 is a traditional 3x1 look and Diagram-2 is an unbalanced sprint draw look. I love this concept because it has three plays built into one. The run concept "King" is a pre-snap box count. A 5 or 6 man box the quarterback can give the ball. When looking at the "Bubble" or "Fast Screen" leverage and numbers will determine that throw. The last read is the single receiver side. If one on one match up has leverage or soft coverage throw the speed out. In the video clips you will see some good reads and some bad reads. Make sure you are clear with your QB on what you want him to do with the football. ﻿Introduction: One of the things I love about this blog is that I get to pick a couple of topics and research them. The challenge is always trying to find enough good video share. In this weeks post I am going to share a few thoughts that I have on Gap Schemes. I was very lucky to find some great schemes that I had in my HUDL RPO LIBRARY. The film clips that I am sharing with you are just a few of the 1,500 that are in the RPO Library. If you think this stuff is good you should see what the library has to offer. If you were like me this weekend you might have been watching the Jon Gruden QB Special with Jared Goff. Cal runs an extraordinary amount of RPOs. The one take away I got from it was how many times Goff was hit while running an RPO. If the quick concept isn't open right away the quarterback is put in a vulnerable spot. In my research I found a concept that gives solid protection and still places the Linebackers into a conflict. In Diagram-1 you will see an example of backer read the with long trap being placed by the backside guard. The Quarterback will read the play side linebacker and determine if he is replacing the trap block or chasing the fly sweep hand off. If the backer replaces the trap the quarterback will give. If the linebacker chases the quarterback will keep the football. Here is the wide and the end zone film of the backer read. I like this example because it starts in a condensed 3x1 formation. With the down scheme and the pulling guard you can see that this is an easy concept to account for all the defenders in the box. What I have found in my study is that teams that running Trap vs. a 4 man front have a better protection scheme while running RPOs, and it makes it a lot harder for linebacker to determine if it is a run or a pass. I have collected a few video clips of some quick game RPOs. My first example is Backer Read Counter Bubble. You can see pre-snap that the offense has leverage on the defense to the 3 receiver side. This example is a counter action on the trap not a stretch like the other examples I will use. The play side backer gap exchanges with the DE leaving numbers to the 3 receiver side. See Diagram-2 below. ​The second example is a counter trap "Pop" concept. I am using the end zone film to show you what the quarterback sees in the play side linebacker. The play side linebacker is flexed out of the box on the #3 receiver. He sees trap and tries to fill inside the block. because of this it is an easy read for the quarterback to pull and throw the football into the seam. See diagram-3 below. The last example is Backer read Trap with the stretch look. These clips are not True RPOs they are Play Action Pass. I do think that this concept could very easily be an RPO in your teams future. Instead of sending the running back out on a route in diagram-4 I would have him block the corner or first outside defender. This would allow quarterback to read linebacker to safety. If the safety were to chase the seam route by the TE end the quarterback could give the ball or keep it. This would make it a true triple threat. This would be a complicated concept, but if practiced early in season it could be a deadly play. This is the one back no fly backer read RPO. I think this one as an RPO is stealing, and is a great 3rd level read. This is one of my first clinics presentations that I ever shared. Tempo was new to people back then so it was a packed house. You need to use Explorer or Firefox to view this presentation. These are still staples in our offense today! One of the things I love about this blog is that I get to pick a couple of topics and research them. The challenge is always trying to find enough good video share. In this weeks post I am going to share a few thoughts that I have on Gap Schemes. I was very lucky to find some great schemes that I had in my HUDL RPO LIBRARY. The film clips that I am sharing with you are just a few of the 1,500 that are in the RPO Library. If you think this stuff is good you should see what the library has. I know there are some coaches out there that think adding RPOs to a teams Gap Schemes make them less effective or will take away from the power downhill run game. I argue that it will actually make it easier to run the ball later in the game. When mixing tempo and calling plays that mess with a players reads they will start to abandon them and begin to react. That is when you have the defense right where you want them. You will need to coach your players to read the box count, look for one on ones, and keep the rules simple, so the quarterback knows when to give and throw. In the two video clips that I am sharing you will see that running RPOs effectively wear on the linebackers. You will see two clips where the linebackers don't even use their keys, they just turn and run to their pass responsibilities. If one of the things you want to do is play fast then Power "Fast" is a play that you need to run. If you are playing a defense that blitzes off the edge a lot then you will love this play. The other reason why RPOs are so popular because it allows you to run the same play multiple times. If you build in a run, field and boundary concept you might be able to run it 3 times in a row before the defense can adjust. Here is an example of an odd front team trying to play games with their Outside Linebacker. Once the backer has committed to the box and you have numbers to the outside stress the defense with the fast screen. One of the best RPOs is my opinion is the Power "Pop". I like it out of a 2x2 formation, and also as a 3x1 formation. When in a 2x2 set you are able to run two slants or seams, and really attack the vacated area in the middle of the field. In our 3x1 formation we will run a bubble and a seam route to the 3x1 side. Because of the pulling guard the linebackers should flow hard to fill run. If the backers don't fill hard and dance around you have a great chance of making a big run. Create doubt in what they are seeing and you will have great success. One of the things I love about this blog is that I get to pick a couple of topics and research them. The challenge is always trying to find enough good video share. In this weeks post I am going to share a few thoughts that I have on Gap Schemes. I was very lucky to find some great schemes that I had in my HUDL RPO LIBRARY. The film clips that I am sharing with you are just a few of the 1,500 that are in the RPO Library. ﻿If you have followed me for awhile you know there are two things that I love; Out number the defense in the boundary, and unbalanced formation. I will share a few of these with you. On Twitter there has been a lot of RPO chat on taking the low hanging fruit on the single receiver side. On issue I have is I don't always want to make that throw in the boundary. The reason I started running the spread offense in 2005 was so I could get my athletes in space. I want to use my run game into the boundary early, so that I can get my best athlete one on one to the wide side of the field later in the game. The first two clips I am breaking down are Buck Sweep runs into the boundary. Clip-1 is a 3x1 set in the boundary using motion, and Clip-2 is a 3x1 closed set into the boundary. If you look a Clip-1 you will see that the defense is playing 3 defenders on 1 offensive player to the field. As an offensive coordinator you need to take advantage of this and make the defense pay. Once they start adjusting by adding defenders into the boundary then you can attack the field. Be patient big plays will come. Now that we have set up the defense and forced them to rotate defenders into the boundary we can now start to keep them off balanced by running our RPOs to the field side for some explosive plays. In Clip-3 you will see an offense take advantage of the single receiver side using the slant to defeat over rotation in cover 3 by the defense. Because there is a single safety I would like to see the single receiver adjust to a skinny post instead of a slant. In Clip-4 you see the offense will run Buck Sweep "Pop". This is great play call because the defense has over rotated into the boundary and is playing press man to man. Using these simple concepts can pay off huge rewards in the course of a football game. Using tempo and multiple formations will continue to force the defense to miss-align. Using simple box count rules, and taking advantage of one on one opportunities will help ensure that you will get more bang for your RPOs. ​This is just a few of the 1,500 plus clips you will find in my RPO Hudl Library. If you would like to see or learn more click the button below. I think you know by now I love unbalanced formations and how they force the defense to communicate and be gap sound. In my RPO studies the last few weeks I came across this great Gap scheme concept ran by Ohio State (Diagram-1). Ohio State ran this formation 4 separate times in short yardage situations. They motioned the slot to the unbalanced side into fly motion to hold the outside force defender. You see a lot of team use fly motion, and then run power or tre away from the motion. In Diagram-2 you can see they run power to the same side as the fly fake. Below you will see two video breakdowns of this play from my Hudl Library. This is the first touchdown that Ohio State score on this concept. You can see in the video that the playside tackle and guard do a terrific job of dominating the double team. The pulling guard does just enough to cutoff the backers and the running back does the rest by bouncing to the outside. In my final breakdown you will Indiana is in a Double Eagle defense and has the play stopped for a minimal gain, but because the backside linebacker over runs the play this becomes a huge run for the Buckeyes. On last weeks #HOGFBCHAT gave me a great idea for my next post. It seems that their is quiet a few coaches that still don't use RPOs in their Gap run plays. I have been running RPOs since 2012 and I would never go back to not having some sort of pass tagged to a run play. In our HUDL RPO LIBRARY we have 100s of examples of Gap run plays tagged with RPOs from Bucksweep to Wham. I picked a few of my favorites clips from this off-season to share with all of you. I also have a live clinic coming up in April where I will talk about the RPOs in the Spartan Spread System. I will talk a lot about the low hanging fruit and pre-snap reads like the concepts you will see down below. See my article from early March on RPO Route Adjustments. If you want to see more video on our Hudl RPO Library click the hot link. Don't forget we are still trying to run the ball. Next to bubble and fast screen the most used RPO today has to be the Y-Stick Concept. It is a versatile passing concept just by itself, but taking it and attaching a run play to it makes it even more devastating. The first read when coaching this is to take the low hanging fruit that the defense is giving you. We will almost always look at the single receiver slant as our first read. If the safety is playing further than 10 yards back, or is in the middle of the field we will throw slant because of the opportunity of making a big play one on one. The next read for us if the slant is taken away is the "Stick" route by the Y. This is a 5 yard route where he will open up away from the defender. We will read the Mike Linebacker if he stays in the box to play run we will throw the "Stick" right now, and take what we can get. If the linebacker chases or leaves the box we will give the ball to the running back. In my RPO HUDL LIBRARY I break down tons of film from high school and the college level. One of my favorite teams to watch using tempo and formations is Ole Miss. In their second drive of the game down 3 points they open by running Inside Zone Stick three times in a row. By using tempo and a "Xerox" call they are able to quickly run the same play and formation over and over. Because they take advantage of using all three reads the defense is left guessing. As you go through the video progression you will see how OK St. keeps guessing and the offense is able to take what they are giving them because essentially 3 plays are built into one very simple offensive play. Another pre-snap read tells the quarterback that the box is down to 5 defenders. This tells the quarterback to give the football to the running back. Because most defenses are taught to stop the last play ran in a "Xerox" play OK St. brings pressure allowing an easy 5 yard gain on first down. HUDL RPO LIBRARY and BOOK for Only $39.99!! These are just some of the breakdowns you are going to find on my RPO HUDL LIBRARY. I break down and teach the different variations that we run Y-Stick, plus many other RPO thoughts. I always find that valuable lessons are learned not when things are going well, but when adversity has set in. After my second season in 2010 our program was in need of a shot in the arm. We finished the season 2-7 and I felt all the fun had vanished from practice because all we cared about was the almighty “W”. After the season ended I met individually with all 75 football players. What I learned from my players would forever changed how I will build and coach my teams. Every topic in this presentation can be purchased in my Building a Team the Spartan Way for just $19.99! Lesson 1: Family Groups- In 2010 our sophomores stated there was a disconnect between them and the seniors and that they didn’t always get along. This was a concern because each year we usually have any where from 4-8 sophomores that play varsity. The solution was to create a family atmosphere where everyone will care and help out one another. In our program we make eight colored teams that compete against each other in lifting, attendance, and coaching competitions. We call them Family Groups. 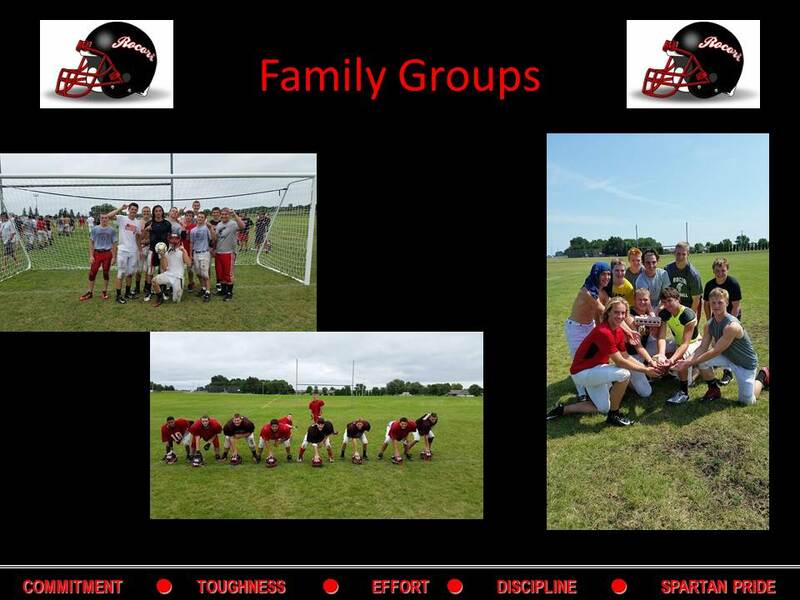 These Family Groups compete for a trophy called the “belt”. The belt is awarded to the team that accumulates the most points at the end of the year. What we found is that everyone wanted to win the belt. It created a strong bond that surprised even our coaching staff. We found that our seniors were more willing to pick up our sophomores that couldn’t drive for morning lifting. They even developed a phone list to call to make sure athletes were up so they wouldn’t miss morning lifting. By building relationships through competitions it created a bond with our players that would not break. Lesson 2: Character Development- Probably the most important change we made in the program was creating a character education program called “Monday Meetings”. During our 2-7 season we lost a lot of games because when things got tough we backed down. By installing a character education program, we were able to create a weekly topic that would match that week’s game theme. Even more importantly, the character education program strives to also teach these young men how to be better people outside of our program. As a coach I believe it is our responsibility to teach our football players how to be men. Times have changed and we believe it is no longer only the responsibility of parents to mentor young students. In order for our athletes to earn a letter, they needed to attend every one of our Monday Meetings. Some of the topics we covered were: gratitude; being a man for others; false masculinity; empathy; and how to treat women. Our athletes were extremely receptive to these topics and made changes to their daily lives that we observed, as well as were reported to us by their family members, faculty, and members of their communities. By creating a culture that takes away the importance of winning it has created more success for our program and I could have never imagined that happening. This is not a short term project it needs to be taught every year. We did see a change right away in our players, but it was after this season I saw the full effects of this powerful program. Our seniors the last two seasons went through tough losing streaks during the middle of the season. When our record was 2-4 our team could have packed it in, but this group did not they managed to win 5 games in a row and make it to the State quarter-finals. I have an extensive 16 week character development program that is ready for you and your players. To see more lessons go to Character Development. Lesson 3: Building Fun into Practice- Another piece of information I learned from my players was that practices were dragging on during the end of the season. Our coaching staff met together during the summer and came up with a couple of ideas to make practice more enjoyable. The first thing we did was make all of our practices last only two hours, and during the playoffs we shortened them to an hour and a half. Instead of conditioning at the end of our Monday walk through practice, we play Ultimate Football with our Family Groups as teams. Every team gets a point for winning their weekly Ultimate Football match. On Wednesday after practice we break the teams into their Family Groups and issue a coach’s challenge for the week. These activities can range from relay races, academic challenges, sporting activities, singing and even touchdown celebrations. We give teams points based on their performance and winning team receives the belt. Spartan Football is a game played exactly like ultimate Frisbee, but we use a football instead of a disc. A player who catches the football cannot run with it and must stop in 3 steps. If the team that possesses the football drops the ball then the defending team picks it up, and is now on offense. Set up fields so that the sidelines are the end zones 10 yards deep and try not to make the fields wider than 20 yards. On our practice field we are able to get 3 games 12 minute games going at one time. The team that wins gets two points and the losing team gets one. We have each team play each other and then create a playoff bracket. Coaches Challenge We score each coach's challenge like a track meet. We have 8 teams so the first place team gets 8 points and the last place team would get 1 point. Here are a few examples of the activities we have done. These are just a few of the activities that we do. We make sure to time the ones that will take a long time. We also try to match physical activities one week and then a mental challenge the next week. Lesson 4: Rewards Go a Long Way- Our coaches use a pretty simple approach on how we handle helmet stickers. Each week every athlete has an opportunity to earn 5 stickers: 2 stickers for making both morning lifting sessions; 1 for playing special teams; 1 for playing defense; and 1 for playing offense. Our team had to win in order to receive the offense and/or defense stickers. That meant that our whole team got them or nobody got them. We had an increase in our quality of play at practice because everyone wanted those stickers to decorate their helmets. I have been blessed the last few years being able to share my lesson and ideas with not only high schools, but with the NFL. I have also had many opportunities to speak to high school athletes, coaches, and athletic directors at many different places. These are just a few examples that our program has had success trying. We found that it has really brought our players closer together because athletes that wouldn’t normally hang out together became closer through the challenges. Our staff also noticed that our players really enjoy football practice because they know there will be rewards if they work hard. Most rewarding for the coaching staff, we received many compliments on our players’ respect for others, both on and off the field. I have had an opportunity to speak to a lot of successful coaches from different states at various coaching clinics this year, and they are also doing similar things. I think coaches have to do what is best for their team, but if you are struggling to get kids out or struggling to get your team to bond together, I know these ideas will work for you. I would like to thank X and O Labs for giving me the opportunity to write this article and also being the number one resources for coaches of football at all levels. If you are ever interested in having me present a topic to your athletes, coaches, or parents please feel free to visit my Consulting Service website.